Like mushrooms after a spring rain, they began appearing in storefronts all over Florida during the depths of the 2008 recession. “Internet cafes” enticed patrons with promises of “sweepstakes prizes” as a bonus for sitting down and connecting to the Internet. What’s more, they wrapped themselves in charitable garb, many of them owned by a group called Allied Veterans of the World whose profits were supposedly donated to needy veterans. 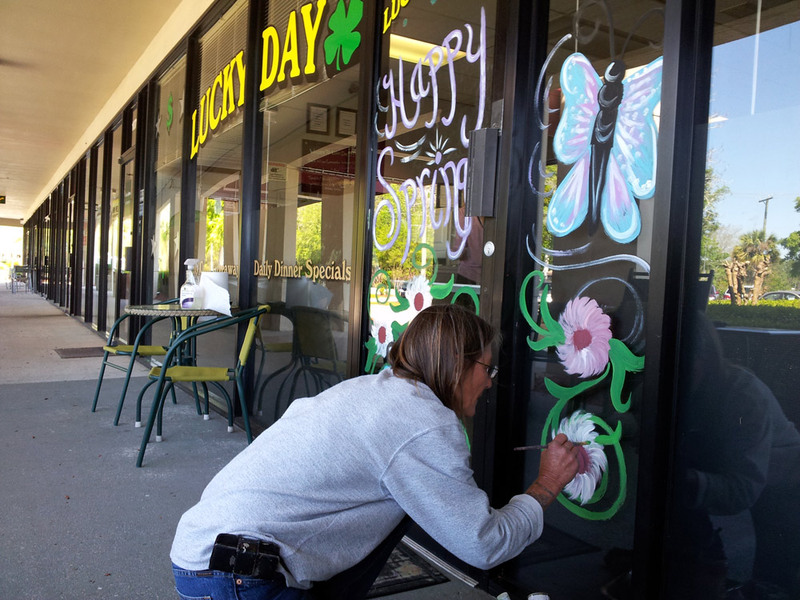 But in the wake of a statewide law enforcement crackdown, it is becoming clear that these cafes are nothing more than thinly-disguised gambling halls—illegal in nearly all of Florida—while the charity itself may be a colossal scam. Moving swiftly, the Florida House voted overwhelmingly on March 22 to ban the cafes. The Senate followed on Thursday, sending the bill to Gov. Rick Scott, who said he’ll sign it. The issue won’t necessarily die: The investigation into the alleged charity has already led to the resignation of Lt. Gov. Jennifer Carroll, and 57 people—Carroll not among them—have been charged with running a $290 million gambling operation, a business that is permitted in Florida only on Native American reservations. And there’s always a chance a new version of Internet cafés reemerges this year or next. 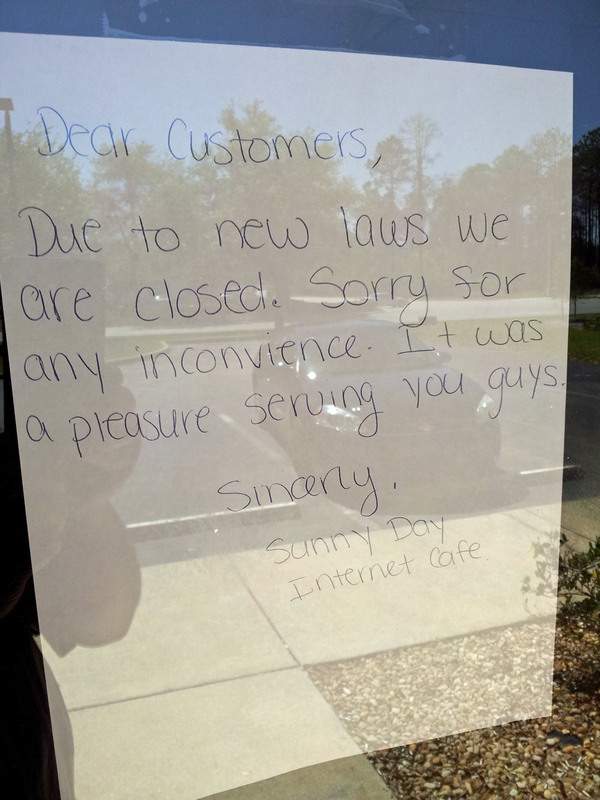 Though three cafes in Palm Coast have already closed in anticipation of the Senate vote, the Lucky Day and Lucky Flamingo Internet cafes (the first in the Winn Dixie shopping center on State Road 100, the second not far away in the Marvin’s Garden business center) are still open for business. In their dimly lit rooms, patrons continue to push lighted buttons and watch slot machine wheels spin, hoping for that big payoff. This reporter visited the Lucky Day and Lucky Flamingo to get a firsthand look inside these establishments that claim not to be offering gambling, but rather a gambling experience through legal, online sweepstakes. I was provided a $50 stake by Flaglerlive.com, in order to participate in the games. No one connected with the cafes would speak to me on the record and interviews with customers were not allowed inside the establishments. But employees did provide this reporter with a typical customer experience, and a few patrons were willing to speak openly outside the front doors. The most obvious thing about these Internet cafes is that no one is surfing the Internet. And no one is drinking coffee. Clerks behind the counters at both Internet cafes explained that the establishments sell time on the Internet as well as time on long-distance telephone calls, a business model seemingly doomed to failure in this era of smart phones and unlimited calling plans. With a straight face, the clerks explained the offerings before adding the kicker, “You will have access to sweepstakes.” Rows of computer screens in both of the Palm Coast Internet cafes glowed with slot-machine-style games, and the controls were similar to those of ordinary slot machines. At both the Lucky Day and Lucky Flamingo, classic rock music is piped in and patrons sit on comfortable, wheeled desk chairs. Ostensibly, patrons are purchasing computer time; this reporter purchased $20 at each location. At Lucky Day, patrons swipe a card into the machine. At Lucky Flamingo, they type in an access code. At Lucky Day , this reporter sat down in front of a game already on the screen. At Lucky Flamingo, the screen offered a choice of many sweepstakes games. After selecting a game, patrons choose how they want to win. They might win if the symbols line up on one of three horizontal lines, or on either diagonal, or on all five lines. Patrons are advised to choose to win on all five. You wouldn’t want to miss a payoff if three pears line up diagonally. A button at Lucky Day signals the images to spin on the screen; at Lucky Flamingo it’s done with a click of a mouse. Pears, oranges, spiders and other symbols rotate, then line up along the horizontal and diagonal lines. Lighted numbers display the amount of money a patron has spent, and how much he or she has won. So, is it gambling or is it a sweepstakes? Missing from the experience is the ringing of a slot machine, and there is no lever to pull as on a traditional one-armed bandit. And there are no ample-bosomed hostesses with a tray of complimentary drinks, although refreshments and snacks are available. But colorful wheels turn and money is won and lost. And while it would appear that time is running out for the Internet cafes, Davis thinks they deserve a place in your local strip mall. “I think they’re pushing this thing too fast,” Davis said. “They need to regulate and tax it. They already have poker rooms.” Of course, Florida also runs a legal lottery and permits pari-mutuel betting at the racetrack. 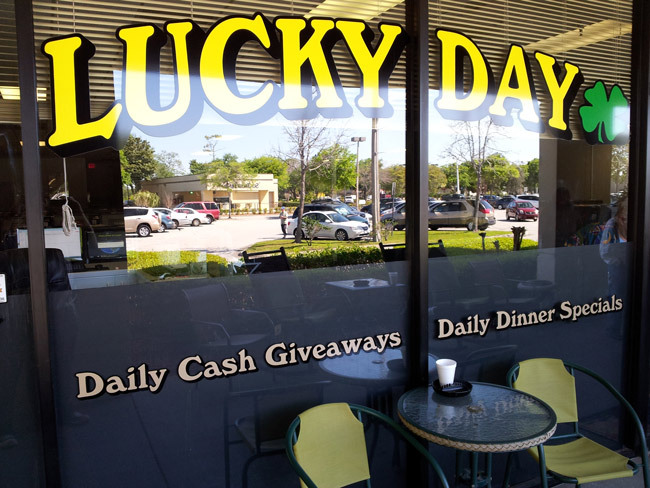 Outside the Lucky Day, two patrons criticized the legislature’s rush to ban Internet cafes. Inside the Lucky Day, a draft of a letter to state officials argues that Internet cafes create jobs, pay taxes and build a sense of community. Critics contend the businesses tear at the fabric of communities by preying on those who can least afford to gamble. Neptune’s note provided a phone number for customers who had not redeemed all their points. The phone number had a typographical error for the area code. A call to the correct number was answered by a recording. A message requesting a callback was not returned. For the record, at Lucky Day this reporter put up $20 and won $1. At Lucky Flamingo, this reporter left behind some unused points and left with $11 back from the $20 stake. These places lure those to come in that really can not afford it. I would recommend that they charge a door fee, of say $ 50 or $100 to get in. I feel this is reasonable because if you are a true gambler this will have no effect on you, and this will protect the ones that should not be there at all. People should not gamble if they are depending on their winnings to pay their necessities. fattening food, lottery tickets, fancy stuff….say maybe you could offer to plan their lives for them… be their nanny and then with that experience you could run for office and be everyone’s nanny. @ECK…..sorry it’s that’s the way you took my post. I only meant that this lovely couple would be devastated both financially and with their health issues etc. should something happen to the one thing that they do own …their home, without insurance. They are free to spend their money and live their lives any way they choose….. But I don’t think spending the very little money they have from their SS checks to gamble it away is a very smart thing to do..when there are other things they obviously need……when you are probably right… They don’t need food either…. They can go gamble and get a “FREE” meal every day…. Just give the owners of these places more money and make them rich, while not paying taxes etc. and leaving these vulnerable old people in the position of becoming. homeless if anything happens…..you are probably one of the owners or someone who works there…. Or maybe you waste your money there too….but maybe you can afford it ……..peace out !!! I am sure glad that the internet cafes have been banned. Now the rocketing crime rate will go down; break ins will decline, DUI will go away so will assaults and robberies. Even the homeless will get roofs over their heads. And the city of Palm Coast can remove the red light cameras because they will find other sources of revenue. Last but not least anyone living here in Palm Coast who wants a job, I mean one that pays a living wage, will become gainfully employed. Good-bye and good riddance to those nuisances there were the root of all evil. Another hypocrite Republican sponsors a bill to control people’s personal lives….the party of “small government.” Right. It’s nobody’s damn business if people want to toss money away. 13,000 people will be put out of work! And, we definitely need more empty commercial space along our roadways, don’t we?! What a bunch of bozos to put more people out of work at a time when jobs are so scarce. Who is it hurting but again…the little people who want to go put their money in the machines and the small business owner trying to make a living. We are totally controlled by Big Business who can afford to put money behind these politicians to get what they want. Ha! I see that Disney and Busch Gardens have been exempted from these new laws – they don’t have to close down their adult arcades, do they? You get as much justice in this country as you can afford! I guess all those in favor of these illegal gambling storefronts wouldn’t mind whorehouses opening up. They provide jobs and safe entertainment as well. Where have you been living? We already have whorehouses and have had them for many years.. Lap dance anyone??? Give me a break… Leave these places alone. Or maybe we should let the strippers run them – then the men of the Senate would not be so hot to shut them down..HA!! Keep voting for these idiots, you get what you deserve! I predict the next time that casino gambling shows up on a referendum, it will be approved by a WIDE margin!